MIT students who decided that there wasn’t enough power at the Occupy Boston protests sent over two bike-powered generators in case of an emergency. The Undergraduate Association is developing a new proposal that aims to restructure MIT’s undergraduate government into a more cohesive body. According to a plan released by the UA Restructuring Committee, the UA Senate could be replaced by a council composed of independently elected dormitory and FSILG leaders. If approved, the UA hopes to instate the new government during an IAP transition period. Oct. 10, Columbus Day, marked the Big Labor and Student Solidarity March, the largest Occupy Boston protest so far. Since Sept. 30, Boston-area residents have come together to protest in Dewey Square, acting in solidarity with the Occupy Wall Street Movement. On Columbus Day, the number of participants in the march was estimated to be around 10,000, according to Nadeem A. Mazem ’06, an Occupy Boston spokesperson and MIT squash coach. 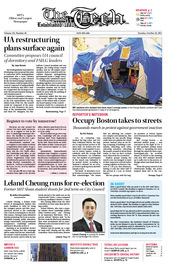 Leland Cheung, a former Sloan School of Management student who made headlines in 2009 for being the youngest person and first Asian-American elected to the Cambridge City Council, is running for re-election. This season, Cheung’s main initiatives include promoting the local economy, affordable housing, public education, energy conservation, and government transparency. Cambridge residents will head to the polls on Nov. 8. Register to vote by tomorrow! Elections are just around the corner! You have until tomorrow, Oct. 19, to register to vote in the Nov. 8 Cambridge municipal elections. The deadline to register in Massachusetts for the Nov. 2 general election passed on Oct. 13.